We pull from lots of different places every year to use some traditional stuff and some new stuff for our children. Over the years we have changed our "programming" to fit the ages of our children. We have used many children's books and children's Bibles but this year we have older children and we are doing a more mature style for them. We read a scripture reading or two, a devotional reading from one of our books above and we sing a hymn or two. This year we added the Christ in the Carols book to read about the hymns before we sing them. The children always look forward to that time. I dare say they were drawn in when they were small by the eggnog/cocoa and dessert we often share but they have grown to love the reading and time together, too. They participate fully in the reading and lighting of candles and always have since the time they could read. 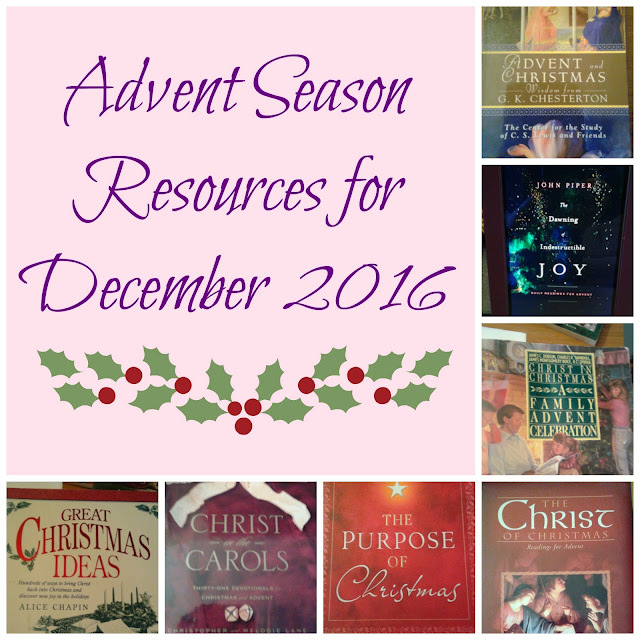 Advent started last Sunday but if you are reading an Advent devotional then most of them start today... December 1st. Here is our list with titles and authors for each resource above and a few extra not shown. Please feel free to share with us in the comments. I always love learning about new resources!